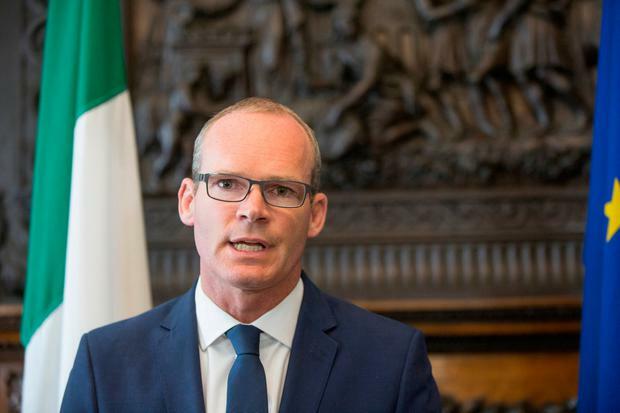 Foreign Affairs Minister Simon Coveney is calling on business people in the North to tell their MPs and politicians that continued membership of the single market and customs union - "or something very like it" - is the only way to go. Ireland could not stay quiet, he said, warning that "too much is at stake". In a strongly worded speech in Belfast, the minister said with Labour's shift toward a soft Brexit and the current make-up of Westminster, Northern Ireland politicians had a "remarkable opportunity" to influence the UK's final position. He said "history shouldn't be re-written" to pretend that UK voters backed leaving the single market and customs union when they voted for Brexit. "Do not underestimate your influence here. You have real influence over the politicians that serve this community," Mr Coveney said. "And with the current arithmetic in Westminster, and the stance now taken by the leading opposition party in the Commons, your politicians have a remarkable opportunity to influence the final approach the UK government takes." The minister told a breakfast briefing hosted by the Northern Ireland Chamber of Commerce that Ireland could not stay quiet. "And for Northern Ireland, the stakes are very high indeed," he said. "Continued membership of this customs union and single market - or something very like it - is the answer. And you have to tell your elected representatives that that is the case." The breakfast event was closed to the press at the request of the Department of Foreign Affairs, which later published the minister's speech. Mr Coveney said that if the UK did not remain a member of the single market and customs union, a solution was needed that would give Northern Ireland the benefits of the customs union and associated responsibilities. He dismissed the options put forward in the UK's recent position papers to deal with customs and the Border post-Brexit. He said highly streamlined arrangements "are unlikely to be streamlined enough", while the proposed new customs partnership "could be a logistical nightmare" to operate. "The customs partnership idea will only prove viable if the UK is prepared to not negotiate separate trade deals with third countries and instead is prepared to take advantage of new EU free trade agreements with countries like Japan or Canada. "Simply put, EU member states will not countenance a partnership which allows the UK to benefit from full EU access while cutting separate deals." The minister said the Irish Government was "distraught" at the UK vote to leave the EU, but it had accepted it. He said it wouldn't accept the claim that people voted explicitly to leave a customs union or single market. "They didn't, and history shouldn't be re-written to pretend that they did," the minister said. Gordon Deegan A financial services firm created in response to Brexit last year increased its pre-tax profits 12 fold to $76m (€67.85m). Donal O'Donovan Carbery Group, the West Cork based producer of Dubliner Cheese, has reported increased sales of €423.5m last year. Craig Giammona Coca-Cola, locked in a renewed battle for global beverage sales with rival PepsiCo, rose in early trading as its push beyond sugary drinks helped it beat on profit in the first quarter.